Kartchner Caverns is one of the world's best living caves and remains the anchor that draws the masses to the San Pedro Valley. The State Park, located on 550 acres at the foothills of the Whetstone Mountains just south of Benson, Arizona, offers picnicking, camping, hiking, walking, and the wonderful still-living caverns. Discovered in 1974 by spelunkers, Gary Tenen and the late Randy Tufts, Kartchner Cavern's pristine cave of massive limestone was unveiled to the public on Nov. 12, 1999, with much fanfare and media blitz. Initially, tours of the Totunda and Throne Rooms were offered throughout the year. The Big Room has since been added for cave enthusiasts to enjoy from October through April. Late April the myotis bat returns from Mexico to give birth, transforming the cavern into a giant bat maternity ward deemed essential to the cavern's delicate environment. All three rooms give visitors close-up views of the beautiful, astonishing and still-growing formations. On the tour you will discover the role water has played in the creation of Kartchner Caverns. You will see some of the tiniest, most delicate formations found in the cave, as well as the largest column in Arizona. This tour includes an up-close look at the variety of fromations and colors that makes this cave one of the Top 10 in the world. The cavern's temperature stays at 68 degrees Fahrenheit at 99 percent humidity, ensuring that its life blood - water - percolates from its surface giving life to the still-growing formations. Katchner Caverns is open every day except Christmas and has a shaded dining area, amphitheater, vending area and gift shop. Contact: 179 W. Flint St.
Kartchner Caverns has been meticulously preserved and offers tours of the Rotunda and Throne Room throughout the year and visitors can take the Big Room Tour from October through April. The Big Room is generally closed in late April when the myotis bat returns from Mexico to give birth, transforming the cavern into a giant bat maternity ward deemed essential to the cavern's delicate environment. All three rooms give visitors close-up views of the beautiful, astonishing and still-growing formations. 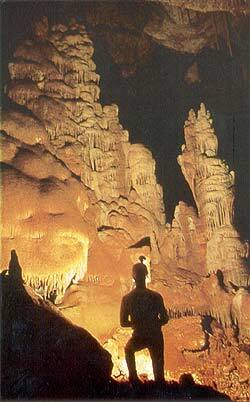 Kartchner Caverns' wide variety of decorations, called "speleothems", began forming drop by drop over 200,000 years. Water seeping from the surface dissolves minerals on its trip through the limestone. Once it reaches the cave, the trapped carbon dioxide escapes from the water. No longer able to hold the dissolved calcite, the drop deposits its tiny mineral load. Over time, these minerals have created the beautiful speleothems and variety of colors found in the cave. Kartchner Caverns is a "living" cave; the formations are still growing! Rotunda/Throne Room Tour: Length: 1/2 mile Time: 1 1/2 hr. (leaving approximately every 20 minutes), tours available year-round. On this tour you will discover the role water has played in the creation of Kartchner Caverns. You will see some of the tiniest, most delicate formations found in the cave, as well as the largest column in Arizona. This tour includes an up-close look at the variety of formations and colors that makes this cave one of the top ten in the world. And for you music lovers...the music that's played at the end of this tour is entitled "Adiemus" (Virgin Records Ltd.). Big Room Tour: Length: 1/2 mile Time: 1 1/2 hr. (leaving approximately every 30 minutes), tours available October 15 - April 15. The Kartchner Caverns story is one of amazing discoveries...both past and present. Stand where the discoverers first entered the cave. Marvel at the strange and colorful formations. Learn about cave inhabitants, both ancient and living. As scientific studies continue, discoveries are yet to be made. The Big Room tour is a longer and more physically challenging tour. Children age 6 and under are not allowed on the tour. During the summer months, the cave's Big Room serves as a nursery roost for over 1,000 female cave myotis bats. The pregnant females return to Kartchner Caverns around the end of April, where they give birth to a single pup in late June. The babies remain in the roost each evening while their mothers forage for insects in the surrounding countryside. During the summer the colony consumes about half a ton of insects, consisting of moths, flying ants, beetles, mosquitoes and termites. Mothers and their offspring will leave mid-September, to begin their migration for their winter hibernation roost. These bats provide the only link between the ecosystem of the cave and the surface. After returning to the bat roost from their nightly forays, the bats excrete waste, forming large guano piles. Most of the other life forms found in the cave depend on these guano piles for their food. Fungi and bacteria consume the guano first. These are in turn eaten by nematodes, mites, isopods, amphipods, and book lice. These are then eaten by spiders, scorpions, mites, millipedes, and centipedes. Scavengers, like crickets and beetle larvae, clean up the leftovers. The bats' guano provides the energy needed to run this complex food chain. It is not uncommon for young children, six years and under, to become uncomfortable in the cave environment. In these instances, the child and parent will be allowed to leave the cave tour, for their well-being and safety. Please inquire upon check-in, if you have any concerns. Elevations range from 4900' at the park trailhead to over 7000' in the summits along the crest of the Whetstone Mountains. The Whetstones are a fault-block mountain range with a variety of exposed geological formations. Vegetation is mesquite-invaded Chihuahaun semi-desert grassland at the lower elevations and open oak-juniper woodland on the higher slopes. The Hummingbird Garden Walk is located on the southwest side of the Discovery Center. The walk is lined with a variety of local vegetation. Some of the varieties include: Catclaw Acacia, Velvet Honeysuckle, Beargrass, Yellow Bells, Sandpaper Verbena, Black Spine Prickly Pear, Autumn Sage, Agave, Aloe, Desert Bird of Paradise, Indigo Bush, and Desert Spoon. The Kartchner Caverns State Park provides campground areas for 62 camping sites with electric hook-ups, water, dump station, restrooms, showers, and flush toilets. There is also a Group Use Area available for Day-Use events (call for reservation). There are shaded ramadas and an outdoor dining area at the 23,000 square foot Discovery Center and six miles of hiking and walking trails. Park Gates Close at 6:00 p.m. and Open at 7:00 a.m. The Discovery Center offers up-close experiences with the Caverns. It is surrounded by a 550 acre State Park and six miles of hiking trails. The grounds also feature a hummingbird garden. Inside the 23,000 square foot Discovery Center there are numerous displays including replicas of various mineral formations. The Center houses the Kartchner Caverns Gift Shop. One of the displays is a fiberglass replica of a Shasta ground sloth. The 80,000 year old remains of one such ground sloth were found in the Caverns.